Caledonian Classics is based in Central Scotland, the gateway to the Highlands within easy reach of both Edinburgh and Glasgow Airports. 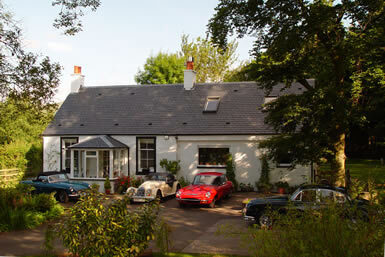 We offer classic car hire and our own unique break ‘The Mini Tour of Scotland’ in our four star guest house Kennels Cottage. We have been featured in The Times, Sunday Times, Scotsman, Scottish Field, Sunday Express and BBC Olive Magazine for the quality of our service and the uniqueness of what we do. 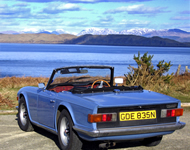 Hire a classic car in Scotland and enjoy driving on open roads free of traffic and surrounded by scenery steeped in history. We have some of the most beautiful and desirable vintage cars and classic sports cars that can be yours to hire for a week, weekend break, or just the day. Austin Healey, Triumph TR6, Jaguar MKII, Jaguar E-Type, MGB Roadster, Morgan 4/4 and two Volkswagen cabriolet Beetles, vintage car hire at its best. 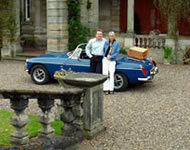 We offer classic car hire and accommodation packages with everything taken care of. Our cars can be hired for a day or any combination of days, we can help you with route planning, booking onward accommodation, dinner reservations and transfers to and from airports and trains stations or garage your car in private garages. Just imagine being met at the airport and taken to a beautiful country cottage described as 'perfect' in Alistair Sawdays holiday guide. Waking up in peaceful surroundings, eating a leisurely home cooked breakfast with eggs fresh from the hens in the garden and strolling outside to see a gleaming classic car ready to be driven away for a day exploring some of the most fantastic countryside in the world. We offer two day packages or we can tailor a package to suit your own individual needs incorporating accommodation from castles to cottages. Absolutely everything is taken car of for you all you have to do is arrive. What a great way to spend someone’s special birthday! Prices start at £195.00 per person for a two day break including accommodation for two nights’ bed and breakfast and two days classic car hire. 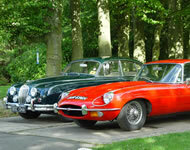 Be original and arrive in style in one or possibly two of our classic cars. We have two MKII Jaguars in green and blue and two matching convertible beetles in blue, both with a white roof. 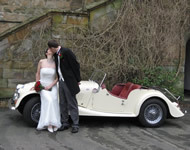 Hire a classic car for your wedding day or honeymoon to make your special day even more memorable! If you require a chauffeur we can organise one for you.